LaToya Ruby Frazier’s grandmother in front of the UPMC Braddock Hospital in Pennsylvania, 2007. Photo taken by, and courtesy of, Frazier. Joe Dyton (@JoeDyton) is a freelance journalist and copywriter in Washington, D.C. He can be reached at dytonwande@gmail.com. 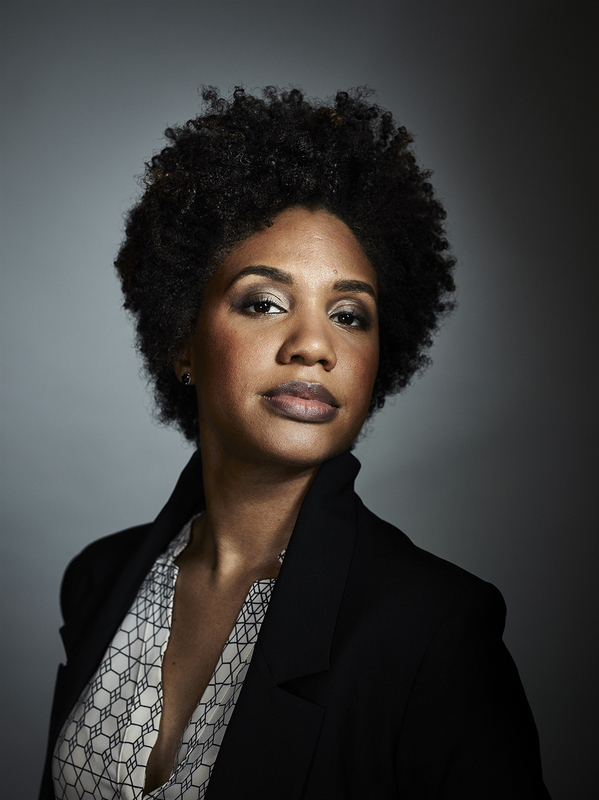 When LaToya Ruby Frazier received a call earlier than usual on September 8, she didn’t know what to expect. “I got defensive and nervous thinking it might be bad news concerning my family,” Frazier admitted. It turned out this call was a good one. It was the call that let the 33-year-old photographer know she had been awarded one of the 24 prestigious John D. and Catherine T. MacArthur Fellows grants. She’ll receive $625,000 over the course of five years to support her documentary work. “When they revealed who they were with … I was in complete denial and thought they were playing a prank on me,” Frazier told ivoh via email. “I couldn’t believe it and became stunned and silent. When we hung up the phone I paced my small apartment taking a moment to understand the new responsibility I have now been charged with. Frazier is also an assistant professor at the School of the Art Institute of Chicago and has taken a look at issues like social inequality, class, and industrial decline through a variety of visuals — including portraits, stills, landscapes, and aerial views. She has documented herself and family in her project, “The Notion of Family,” which paints a picture of the economic decline and failing healthcare system in her hometown of Braddock, Pennsylvania. It is through visual arts that Frazier hopes to change the narrative of Braddock, which after years of abandonment has been seen by the outside world as a violent ghost town. Jobs have been outsourced, social services continue to be eliminated, and the steel industry has wreaked havoc on the environment. The town took an even bigger hit when Braddock closed its community hospital. The closing –combined with the loss of Frazier’s grandmother to pancreatic cancer, discrimination the Black community faced in the steel mills, and the overall healthcare inequality — forced Frazier to take action. She began to produce a series of photographs with the activist group Save Our Community Hospitals (SOCH). Frazier and her Grandma Ruby, 2005. 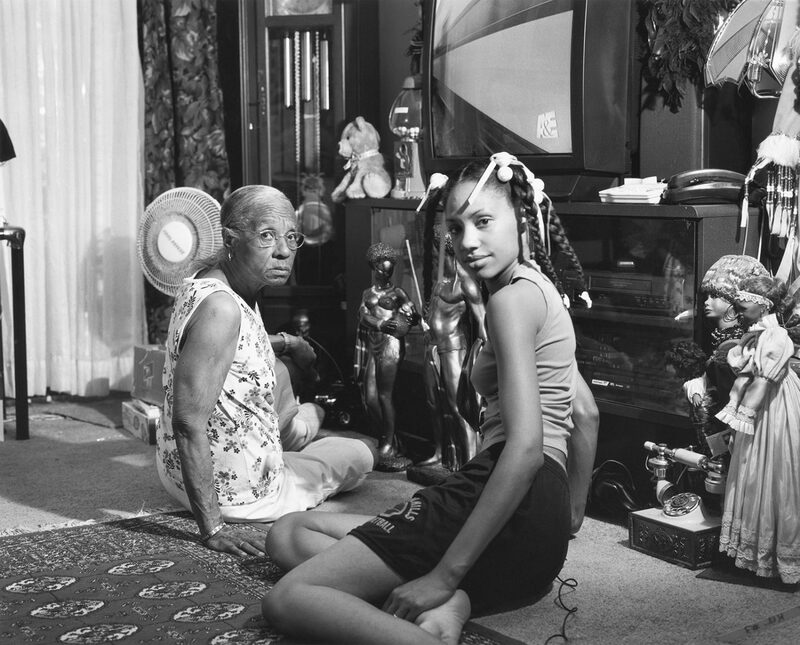 Photo taken by, and courtesy of, LaToya Ruby Frazier. “[SOCH] wanted to get the message out about the devastating loss of our community hospital and raise awareness about the temporary free health clinic that was located in the municipal building launched by doctors from the Muslim Council of America,” Frazier said. To visualize the protests, Frazier documented the ads and billboards she saw in New York City and made portraits of SOCH members protesting in front of the demolition of Braddock hospital. She then collected statements and questions from community members who were offended by the ads and transformed all of the images and texts into photolithograph silkscreen prints. She wanted viewers to see the rebranding propaganda of the corporate ad campaign juxtaposed next to the reality of the current crisis residents face. The set of prints was on display at the Andy Warhol Museum and the Whitney Museum of American Art. During the exhibitions, Frazier developed a curriculum to educate teachers and students alike about the history of advertising and the resistance of the Pictures Generation. Frazier also used this time to introduce them to voices and perspectives of Braddock residents that the media overshadowed and silenced. The Whitney Museum acquired the works for their permanent collection and the resources were sent to the Free Health Clinic in Braddock for medical supplies. 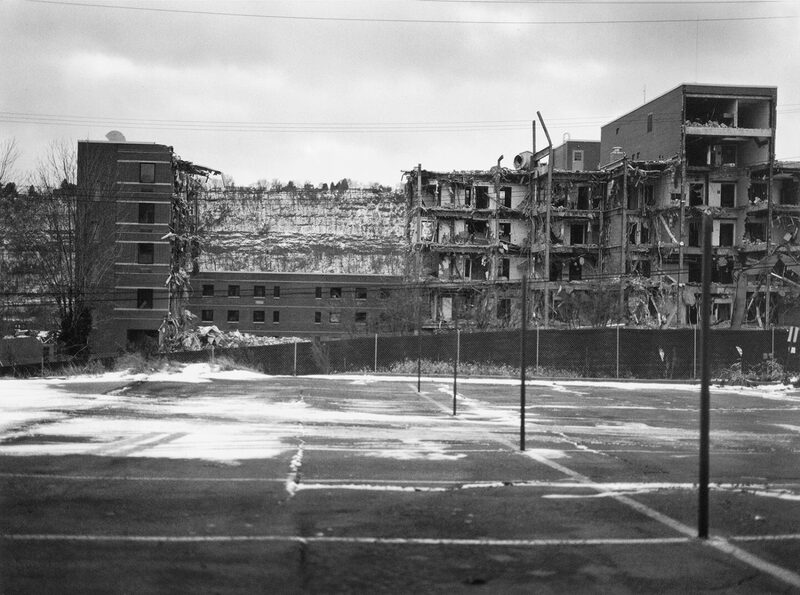 UPMC Braddock Hospital and Holland Avenue Parking Lot, 2011. Photo taken by, and courtesy of, Frazier. “The way I use contemporary art as a photographer, video, and performance artist can be found in the tradition of late 19th and early 20th century photographers and artists like Jacob Riis, whose images of children working in factories led to child labor laws, and Lewis Hine, whose photographs in the Pittsburgh Survey led to social reform for steel workers’ living and working conditions,” Frazier said. “[It can also be found in the tradition of] Gordon Parks, whose artwork shed light on segregation and racism in America and the movement of conceptual artists that used imagery from mass media to reflect and deconstruct the way in which popular culture controls how we perceive race, class, gender and citizenship in our society. Prior to receiving the MacArthur grant, Frazier used her voice and gift as a visual artist to make a difference in Braddock and beyond. The prize money now affords her the opportunity to continue to do so, perhaps even more now than ever, and it’s a responsibility she takes seriously. “[The] prevalent tendency toward softmindedness is found in man’s unbelievable gullibility. Take our attitude toward advertisements.